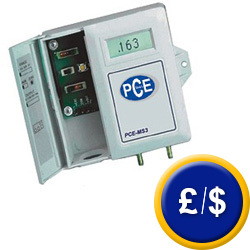 The PCE-MS manometer allows the user to select its measurement range (with these selectable ranges for the PCE-MS 3 model: 25, 50, 100 or 250 Pa). The manometer has an analogue output and LCD. This manometer can be connected to mains power (13 to 30 VDC/VAC). It is designed for users who need to select from a variety of ranges depending on the job at hand. These changes can be made in the manometer whenever the user requires them. The repeatability is better than 0.5% (relative to the full range).. The electronic component of the manometer consists of a micro processor which guarantees a high level of accuracy of ± 1% over the measurement range. If the manometer is used as a fixed unit in a process which includes regulators, the unit can be mounted on a wall as well as become a portable unit. The LCD of the manometer allows the user to view readings while taking measurements. The keypad permits the user to perform a zero reset when required. The analogue output of the manometer can be used to connect an optional data logger. With the data logger measurements can be taken over an extended period of time, and by using the optional software the data can be transferred to computer for further analysis. At the following link you will find another type of manometer. Can be reset to zero via the keypad when required. The manometer is a portable unit, but it is primarily used as a fixed unit together with regulators to monitor and maintain a process. 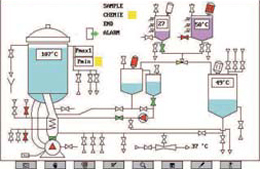 The image shows a system of regulators connected to a manometer. Traditionally, it is used in white rooms or installed in production lines that require a low negative pressure for the manufacture of products in optimal conditions. It's easy to use and it provides the best results. Note: Pressure in excess of the product measurement range will damage the sensor!